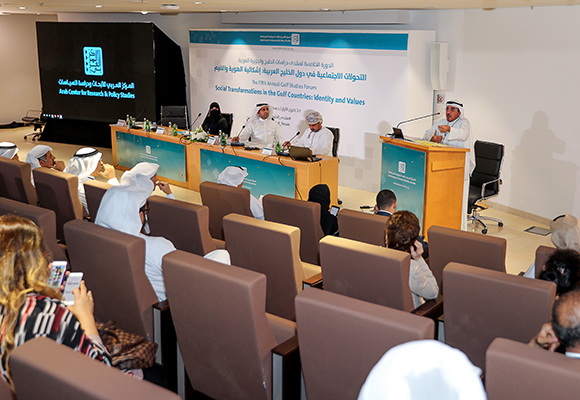 The second day of the fifth Gulf Studies Forum organized by and held at the Arab Center for Research and Policy Studies in Doha, Qatar, was held on 02 December 2018. 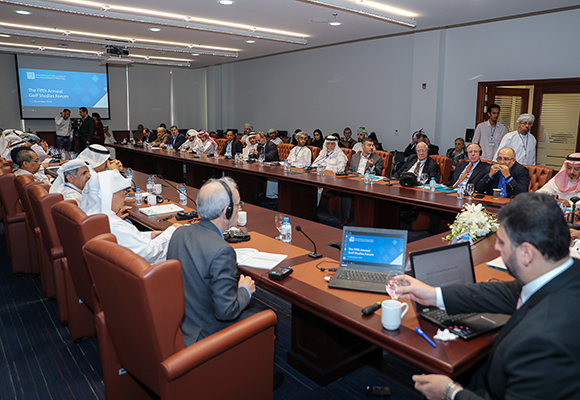 Like the first day, the second day was conducted in two tracks – one on Social Transformations in the Gulf, and the other US-Gulf Relations. 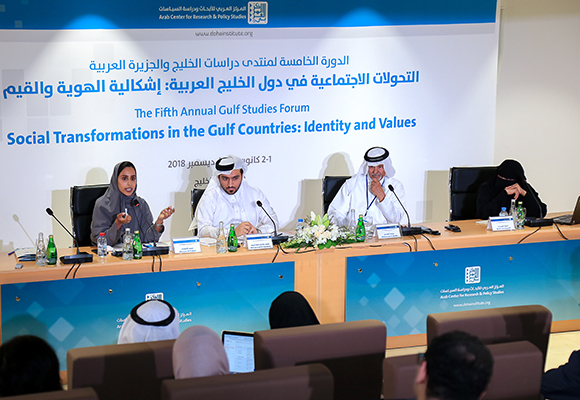 The first session of the Social Transformations track was opened by Alanoud Al Khalifa, whose paper examined the concept of Gulf identity and attempted to study the factors that prompted the countries to foster this identity during certain periods, and identify the factors that affected the identity on its journey and define its future. 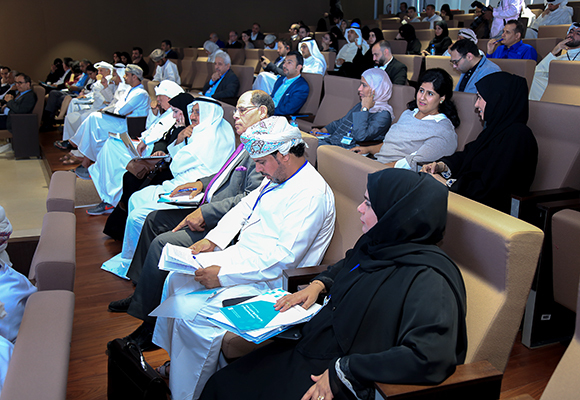 Al Khalifa was followed by Nesibe Battaloglu, who presented on the international determinants of building regional and national identities in the GCC countries. She argued that international factors are consistently one of the most important dynamics shaping identity in the Arab Gulf region given its unique location in global energy markets and strategic importance. The session’s last speaker was Amel Hammami, whose study uses motivated identity construction theory to question the identity construction motives behind the European Union and the Gulf Cooperation Council. She concluded that both push and pull factors can be identified: the push factors cover a set of political and economic factors, whereas the pull factors involve cultural legacy and geostrategic contest. The second session of the Social Transformations track was opened by Munira Al-Rumaihi, who argued that the noble objectives of the Gulf Cooperation Council – an umbrella intended to strengthen ties and cooperation between closely related Gulf countries – were shattered on June 5, 2017 with the imposition of an unprecedented and unjust land, sea, and air blockade on the State of Qatar and its people by its sister Gulf states. The second paper in this session was presented by Maryam Al-Kuwari, who examined the role played by art, specifically poetry and song, in political transformations and reproduction of identities in the Arabian Gulf region. She noted that shelat poems were used by the blockading countries as a means to weaken and destroy the morale of the Qatari people, but also served as a means of defense adopted by Qataris to raise morale, strengthen national unity, and rouse patriotic and nationalist solidarity in the face of external threat. The last speaker was Mohammed Al-Hashemi, who argued that the ongoing Gulf Crisis and previous crises cannot be blamed for weakening the unified Gulf identity, since the recurrent crises in the region are the inevitable result of the project of a unified identity. He concluded that the breakup of the GCC following the Gulf crisis will have no great effect in political, economic, or even administrative terms, because no such integration at any of those levels previously existed. The final session of the Social Transformations track was begun by Hasan Joher, whose paper explored the problems facing the Gulf identity, especially given expanding globalization and the steps required to form a unifying transnational identity between the Gulf States. Joher concluded that the Gulf has been slow to foster clear regional identity or to add value to the existing national identities. He claimed that the fault lies with the national identities themselves, which are supposed to be the groundwork for the new collective identity. 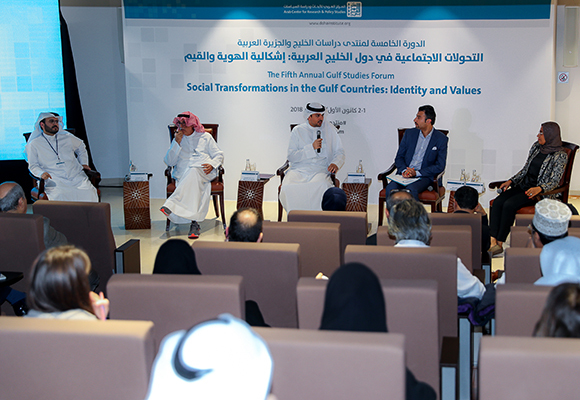 It is important to rebuild the national Gulf identity on the principle of citizenship and translate it into practice. Saif Al Mamari and Zainab Al Gharibi then presented a jointly written paper on education in Gulf countries and its impact on shared identity. This paper showed that national identity in the textbooks was more closely linked to common settled life (39.3%), followed by shared culture (31.7%) while shared history was the least important factor (29%). Gulf identity received little mention (7.2%) in comparison with national identity (48.3%) or Islamic identity (35.1%), while Arab identity stood at 9.4%. The session was concluded by Meznah Al Azmi, whose study proposed that educational institutions, whether schools or in higher education, are the main nurturer of young people. Her two main conclusions, based on a survey, were that respondents considered educational institutions – both public and higher education – to play a moderately important role in building Gulf national identity; and that there were no statistically significant differences according to gender or type of educational institution between the respondents’ perceptions toward the role of educational institutions in building Gulf national identity. 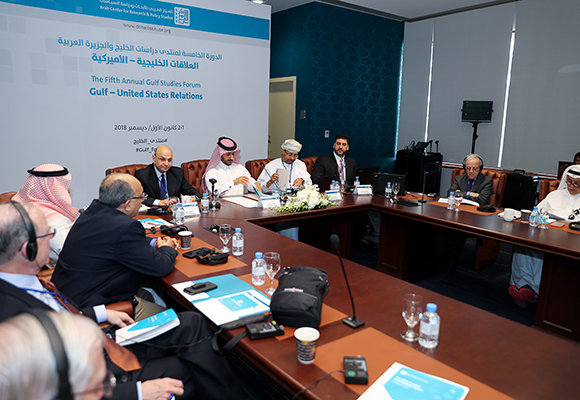 The first session of the US-Gulf Relations track was opened by Shafeeq Ghabra, who argued that Washington adopted a policy of pressure on the Gulf states towards issues such as Iran, oil prices, arms contracts, and the war in Yemen. Ghabra concluded that Gulf Arab states such as Kuwait, Qatar and Oman have made attempts to alleviate the US intervention and the US midterms have predicted a change in the balance of power in the United States, which are likely to affect President Trump’s aggressive policy towards issues such as the Yemen war and the blockade on Qatar. The second speaker, Abdullah Baabood, discussed the new transformations in Saudi– American relations under the current US administration, with a focus on regional and international changes since the Obama presidency. The third speaker, Osama Abu Irshaid, attempted to account for confusion within the Trump administration following the announcement of the blockade on Qatar by exploring the stark divisions between different institutions within the administration. 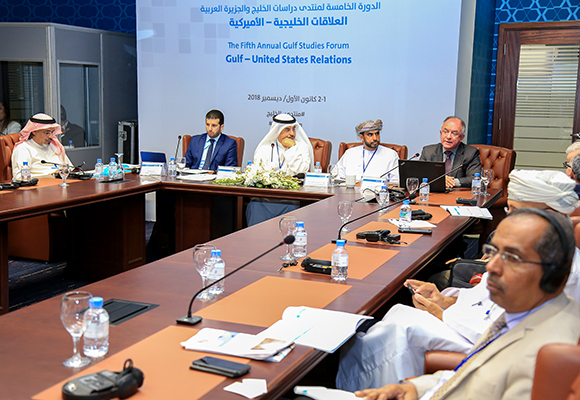 The second session of the US-Gulf Relations track was begun by Yousuf Hamad Al Balushi examined the changes to supply and demand on the global oil and gas market; the impact of changes to the oil and gas market on relations with the Arab Gulf states; and the importance of enhancing economic diversification in the Arab Gulf states, especially when dealing with oil revenues. Naji Abi-Aad then discussed the developments expected to come with the planned exploitation of shale gas in different regions in the world )China, North Africa, Canada, etc. ( in addition to the new wave of LNG liquefaction plants around the globe, encouraged by the decreasing costs of the entire gas liquefaction chain, the discovery of new, large reserves in various areas, and the growing appetite of consumers to import gas in its liquefied form, both for security and diversification reasons. This session was closed by Rabah Zeghouni, who discussed the issue of wealth and power for American energy policy in the Arab Gulf region, this study uses the approach of international political economy, which assumes a relationship of mutual influence between the market and foreign policy. 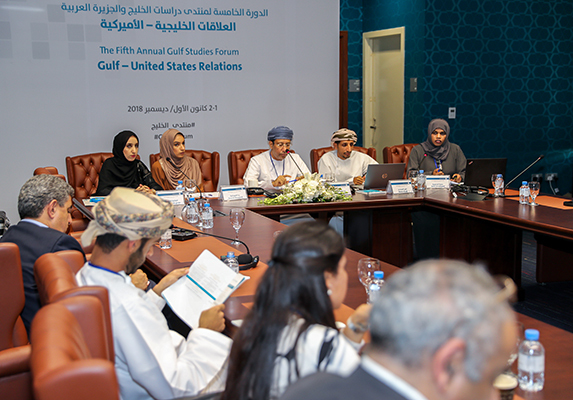 The final session of the US-Gulf Relations track was opened by Suad Bait Fadhil, whose study examined the historical importance of Omani-US relations and provides a review of the role played by Oman from the era of Sayyed Said bin Sultan up to the reign of Sultan Said bin Taimur. This was followed by a joint paper presented by Alghalia Al Mughairi and Rana Al Dhowania, who discussed Omani-American economic relations during the reign of Sultan Said bin Taimur. concludes that economic cooperation between the United States and Oman began in the 18th century and further consolidated in the 19th century with the signing of the first commercial treaties between the two parties in 1833. The study also makes clear that oil was an important factor in the economic relationship during the reign of Sultan Said bin Taimur, deepening economic and trade relations between the United States and Oman, which possessed significant oil fields that drew global attention. The final talk of this track was given by Bahia Al Adhoubi, who presented on the US military presence in Oman and its impact on the stability of the region. The study revealed the nature of the military facilities provided by the Omani government for military aircraft from the mid-20th century until the early 1980s. It also explained the effect of the US military presence in Oman on the strategic position of Oman and the Gulf states.